Zona Tool is pleased to be able to offer Olson® scroll saw blades. Both Zona Tool and Olson Saw are under the same roof and are brands of Blackstone Industries LLC in Bethel, CT. Olson has been a leading manufacturer of scroll saw blades for more than 80 years, offering a full line of superior quality blades for most scrolling applications. Olson blades are for use with scroll/jig saw machines sold by Delta, DeWalt, Dremel, Skil, Rockwell, Pro-Tech, Powermatic, RB Industries, Hegner, Sakura, Shopsmith, Excalibur, Rexon, Ryobi, Sears Craftsman, and Makita. (virtually all domestic and imported scroll saws). They can also be used in hand held fret and jewelers saw frames. 5 Inch Pin End Scroll Saw Blades, (the 5″ is measured between the pins) are the most popular scroll saw blades. Perfect for Sears Craftsman, Penn State, Delta, Ryobi, and all 15″ and 16″ imported scroll saws. 5″ pin end blades offer a choice of tooth styles that includes Regular, Hook, Skip and Skip Reverse. Teeth Per Inch vary from the most coarse – 7TPI, to the finest- 25TPI. 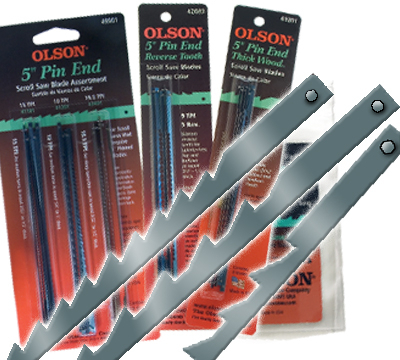 Olson’s Pin End Scroll Saw Blades come in packs of 6, 12, 1 Gross (144pcs), and an 18pc assortment of 5″ pin end blades. 3 Inch Pin End Blades measure 2-3/4″ between pins and are available with regular or skip teeth. They are used on Hobby Scroll Saws such as Sears Craftsman® , older Dremel® MotoSaws, Delta 15″ and Emco Lux to cut wood, plastic and thin mild metals and provide a medium smooth finish. Teeth Per Inch vary from the most coarse- 15TPI, to the finest- 25TPI. 4 Inch Pin End Blades are a recent addition. Olson offers these blades to fit the newest Dremel® MotoSaw™. The blades measure 3.9″ between pins and are available with regular or skip teeth  in 6-packs, 12-pack, or in bulk packs of 144 blades. Olson has many unique tooth styles and dimensions for Plain End Blades. The Scroll Saw Blade Conversion Kit can convert most 16″ scroll saws to accept both plain end and pin end blades! Easy to Install. Contains all hardware and tools needed for installation. Product link below has list of 16″ scroll saws the Conversion Kit will fit.